Dog agility is a great way to have fun with your dog whilst developing a great working bond between you. In agility classes you will learn how to guide your dog over a series of obstacles including jumps, tunnels, 'A' frames, dog walks and see-saws. It's not just for collies either - any dog over twelve months old can enjoy agility. However, as most work is done off-lead your dog must have a good recall, be happy to drop his toy and hold a sit and wait. If your obedience is not quite up to scratch our Foundation or Improvers course will quickly bring you up to the required level. 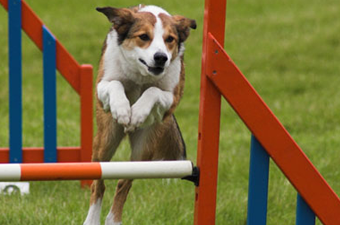 Agility Classes are held on Saturdays and costs £10 per lesson. Please see the Your Responsibilities page for information on what to bring along and what is expected from dogs and handlers whilst attending classes. Places in all classes are strictly limited ensuring plenty of individual attention. Dog Agility Classes is a great way to have fun with your dog whilst developing a great working bond between you. Book a Dog Agility Class in Hertfordshire.